If the rain holds off, some of us might find ourselves cooking outside this weekend. And if it doesn't hold off, well, some of us die-hards will still find a way to cook outside. I have been known to clamp the shade umbrella from an old beach chair to the smoke pipe of my grill. Either way, let's see if I can get you in the mood, with a chance to win a copy of Steven Raichlen's newest book, "Planet Barbecue!" Raichlen stopped in Charlotte for a meal at Mac's Speedshop last year right after he'd completed his latest world grilling odyssey, this one covering 60 countries and 309 recipes. Reply below and I'll enter you in a random drawing for the book (on Tuesday -- even food writers take a holiday weekend off now and then). Until then, here are two very different sauce recipes for the book. One or the other ought to work with whatever the weekend weather throws our way. From "Steven Raichlen's Planet Barbecue!" Raichlen calls this "the sort of barbecue sauce Kansas City pit masters have been swabbing on ribs for decades." Makes about 2 cups. Combine all ingredients in a saucepan and whisk to mix. Gradually bring to a simmer over medium heat. Simmer until thick and flavorful, about 8 to 10 minutes. Taste for seasoning, adding more vinegar if necessary. Transfer to a bowl or clean jars and cool to room temperature. Refrigerate, covered, up to several weeks. Return to room temperature before using. This is from Raichlen's directions for making Puerto Rican Pork Shoulder, or Lechon Asada. That's a major undertaking (it sounds great, though). But the sauce served with the pork grabbed my attention. You could serve it with grilled pork chops or pork tenderloin. Place the soda, ketchup and barbecue sauce in a saucepan and whisk to mix. Bring the sauce to a simmer over medium heat and let it simmer gently until thick and richly flavored, 10 to 15 minutes. Cruising the Charlotte Regional Farmers Market recently, I spotted a pile of vegetables labeled tindora. Even though I found them at a stand that mostly has Mexican produce, I eventually learned tindora is more common in Indian cooking. It comes from a plant that is sometimes called ivy gourd (if you plant it, be careful - it can be invasive). Trolling around in Indian cookbooks and on Web sites, I turned up a number of dishes that use it, mostly dals and curries. But I wanted something simpler, more like a side dish. So I called on Monica Bhide. A national blogger and author of the fabulous book "Modern Spice," Bhide specializes in bringing the ingredients and flavors of her native India to her American kitchen. She knew tindora and gave me some great tips on cooking it and other vegetables. First, wash the tindora well and pull off the dried-up stems if necessary. Cut it half lengthwise and in half again, cutting it into wedges like french fries. Next, heat some vegetable oil in a skillet and add what Bhide calls "the holy trinity of Indian food - garlic, cumin and onion." I cut about half an onion into slices and cooked it over medium heat, stirring often, until it was starting to soften, then added cumin and minced garlic. I used ground cumin because it was what I had handy, but cumin seed would probably be good. Or maybe even a combination of both, so you get plenty of cumin flavor and a little crunch from the seeds. 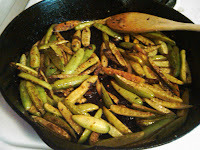 Add the tindora and saute, raising the heat at little if you need to, and stir occasionally, breaking the tindora up into wedges. Cook until the wedges start to brown in spots and are getting tender. Just before you finish cooking it, add a little salt, crushed red pepper flakes and a bit of turmeric for color. "Tindora by itself is a bland vegetable," Bhide told me. "This is very aromatic and you get the toasty flavor of cumin." 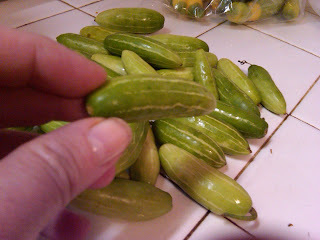 Even cooked through, the tindora retain a little crunchiness from the skin and it makes a terrific side dish. Bhide said she uses that method for a lot of vegetables, like cauliflower or zucchini. One thing on preparing tindora: When you cut it open, it usually has white or very pale yellow seeds. Sometimes riper ones will have red seeds. There are reports floating around on the Internet that you shouldn't eat tindora with red seeds, supposedly because of something called "brain fever." My batch had one with red seeds and I ate it anyway. No brain fever so far, although I found the texture was slimier, a tiny bit like okra, and I didn't like it as much as the crunchier ones. Up to you. What did you find to cook with this weekend? At the Charlotte Regional Farmers Market, I scored fresh favas, very fresh sweet peas, mushrooms, multi-hued skinny carrots, and a bag of tart cherries. 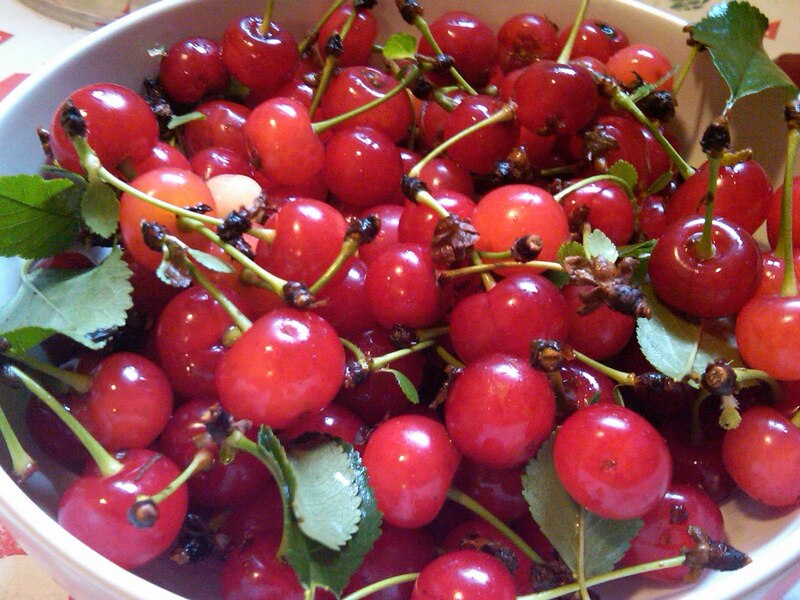 Cherries are a rarity around here. I spot them about once a year, so I know to grab them when I see them. These came from a farm near Kannapolis. At home, I peeled the favas (a two-step process, if you've never done it) and shelled the tiny peas, enjoying that satisfying plunk-plunk-plunk sound as they fell into my bowl. I sauted the mushrooms, then added the favas, peas and a little cream and braised them together. The cherries called for more handling. 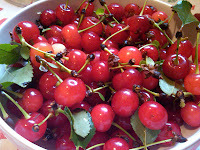 I pulled out Thomas Keller's "Ad Hoc at Home" and used it as a guide for a little cherry compote to spoon over my breakfast yogurt and a batch of potted cherries with bourbon and vanilla to tuck in the refrigerator. And you? What fabulous food finds landed in your life this weekend? I asked you guys to share your quick go-to ideas for easy side dishes. Barbara contributed a tomato salad with a bit of garlic and lots of basil. Good one for summer. - Garlic paste and Greek yogurt dabbed on a platter of roasted beats. -- Buttered pappardelle pasta tossed with chopped cilantro. -- Carrots dressed up in endless ways. -- Spaghetti tossed with asparagus, bacon, Parmesan and warm garlicky olive oil, served on the side with a steak or grilled fish. -- More salads. An endless variety of salads. -- Roasted or grilled vegetables. -- Couscous tossed with all kinds of things. Grab an idea and see if it lifts up one of your meals this weekend. And Barbara, send your address to me at kpurvis@charlotteobserver.com so I can get the book in the mail. We spend so much time (or, OK, on a weeknight, maybe not so much time) coming up with main dishes. All our meal planning tends to get focused on entrees, and the side dishes just end up being a salad or a frozen vegetables tossed in simmering water. We need 9 servings of fruits and vegetables a day. If we fall into the trap of the same old simmered side dishes, we're cutting ourselves short on getting some of the best nutrients we get all day. But who has time to put together a complicated side-dish recipe for a weeknight meal? There's where the side dish staples come in. Stuff you can keep on hand and throw together without thinking about it. You know where they do great side dishes like that? Italy. All those antipastos are really just small side dishes that you eat before you get to the main course. Looking through Mario Batali's new book, "Molto Gusto: Easy Italian Cooking," I kept noticing all the small but great ideas for vegetable dishes. 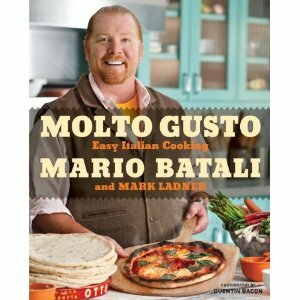 For this week's cookbook giveaway, I have a copy of "Molto Gusto." To get in the drawing, post your name here and include a short description of your favorite fall-back side dish, something fast and simple to put together on a weeknight. Deadline: Friday. Check back to see who won, and see what great ideas for side dishes we get. To get you in the mood, here's a recipe from Batali's book. I bet it would work even better with frozen peas, rinsed under a colander to thaw them. From "Molto Gusto," by Mario Batali. Combine the peas, onion and mint in a medium bowl and toss with vinaigrette. Season with salt and pepper and serve, or let stand up to 1 hour to bring out the flavors. Can be refrigerated for up to a day; bring to room temperature before serving. Saturday (that would be tomorrow) is Farm Day at Poplar Ridge Farm in Waxhaw. It costs $10 a car that can be used toward the purchase of farm produce. And you can get a look at what it takes to be a USDA certified-organic farm. Get details at http://www.poplarridgefarmnc.com/. The farm is about 15 minutes from I-485 and Providence Road. Hey, P.J. Mullen of Charlotte -- stay-at-home dad, blogger (www.realmendriveminivans.com), air-guitar player and football fanatic - nice job on that video for the Perdue Verifiably Good Chicken Contest. P.J. won the grand prize, $500 and coupons for a year's worth of free chicken, for his entry, Bracilo di Pollo with Polenta. See the video here. Judges included my colleague Andrea Weigl of the Raleigh News & Observer, and Priscilla Tsai of Creative Loafing in Charlotte. After 10 years of going to the annual James Beard Foundation Awards in New York, I'm getting a little jaded. "Yeah, OK, that's Tom Colicchio. Wake me up when Daniel Boulud STOPS dancing on the tables." But this year's awards outdid themselves in fun potential. This was the first year the book awards were moved out of the overlong and overcrowded Monday night gala. They were added to the media awards on Sunday night, joining the journalism and broadcast awards and making that event a little more crowded and a little overlong, but a lot more fun. Someone recently said the media awards were "the high school prom of the food world," compared to the gala being "the Oscars of the food world." Now the Oscars has a Golden Globes the night before. Kelly Choi of "Top Chef Masters" and Andrew Zimmern of "Bizarre Foods" were the hosts, and the sit-down dinner featured four courses of spot-on food, from Greg Hirigoyen's perfect first course of poached asparagus spears to Suzanne Goin's short ribs, with flavors that included mint leaves. Who thinks of mint with short ribs? But that's a chef for you, and it really worked. Monday night was the awards gala at Lincoln Center's Avery Fisher Hall. Removing the book awards from the presentation made it, oh, maybe 5 minutes shorter. (They used "Star Wars" music as the theme all night, but after 3 hours and 15 minutes, it's hard not to sound like Chewbacca yawning.) Among the highlights, Sean Brock of McCrady's in Charleston won Best Chef Southeast and thanked, among other things, "The South, bourbon and my wife." Tom Colicchio won the big one, Outstanding Chef, and noted "I share a birthday with Julia Child and a hairstyle with James Beard," then went on to salute the incredible contribution immigrants have always made in the American food world. Funny and classy. The biggest crowd ever hit the food serving stations all at once. Following my usual pattern (eat, shuffle, eat, shuffle), I managed some highlights: Foie gras-filled prunes at D'Artagnan; tender Pear and Fresh Pecorino Ravioli by Fortunato Nicotra of Felidia; Champagne-Poached Prawns With Spicy Cucumber Salad and Green Curry-Coconut Sauce by Mark Franz of Farralon; and Tostidas de Tinga by Priscila Satkoff, Salpicon, an acolyte of Rick Bayless. My very favorite: James Kent of Eleven Madison Park filled lids of caviar tins with a layer of Scottish Salmon Tartare topped with a creamy smoked mousse topped with yuzu and bright pink trout roe. Balancing-act food seems to be replacing tall food. Kevin Binkley of Binkley's served little cups of hot bacon soup with a tiny spoon of chopped raw scallop balanced on top and a tiny oyster cracker "glued" to the lip. You stirred the scallop into the hot soup and then spooned or drank it up. 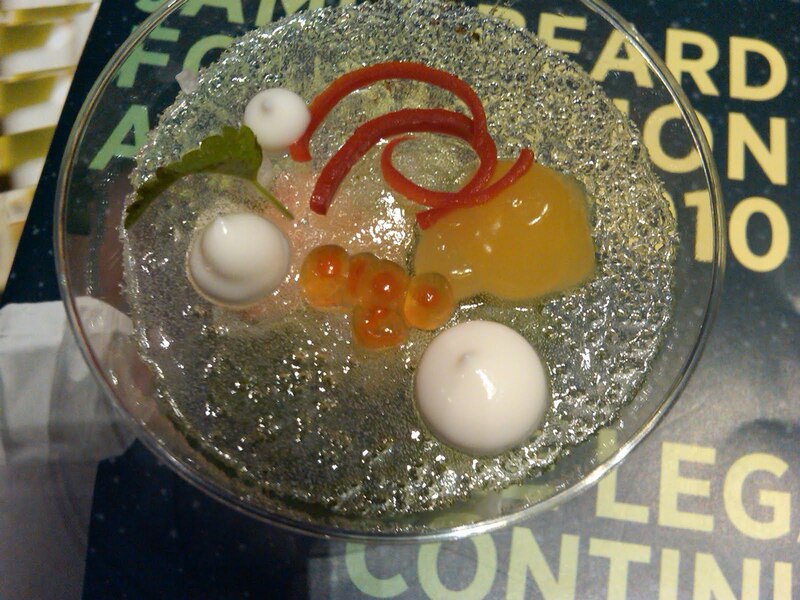 And my personal favorite, pictured above, was by Curtis Duffy of Avenues at the Peninsula in Chicago, who trained with Grant Achatz at Alinea: The bottom of the clear cup held king crab chunks in a cucumber consomme. The top of the cup was covered with a clear sugar disc decorated with dabs of floral cream and lemon balm. You broke through the sugar with a spoon and let it all fall together. 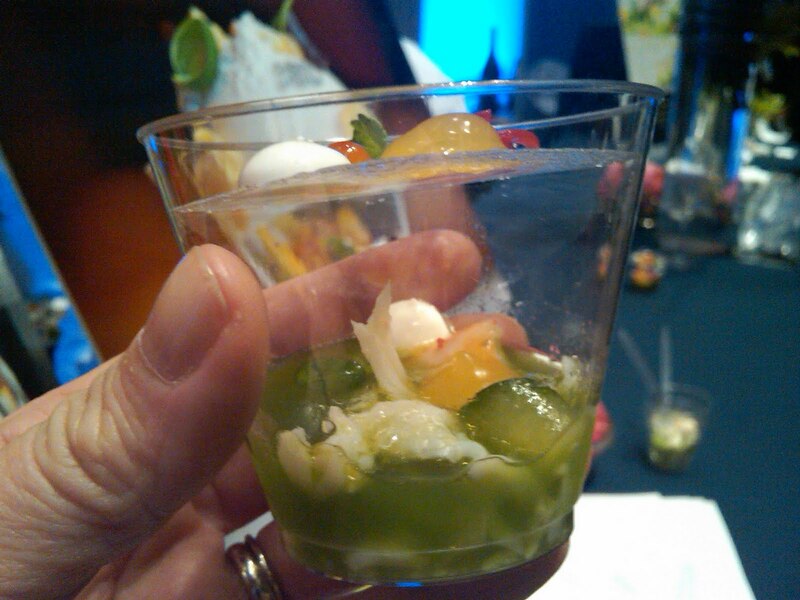 It looked magical, like a tiny terrarium, and tasted amazing - spicy, cool, sweet and refreshing, all at the same time. Sort of like the Beard Awards this year, actually.